Ella Shepherd is able to enter people’s dreams and memories using the technology that her mother created. The government finds out what she can do and asks her to spy on a rebel group. The only problem is, the leader of the rebel group knows her and claims that he and she were once in love. Ella has no memory of this and realizes that somebody has been inside her head and erased her memories. Now she can no longer trust anything in her own mind because she doesn’t know if it was real or planted there by someone. After reading the Across the Universe series, I will read anything that Beth Revis writes. This book did not disappoint me! Ella is able to use the machines that her mother built to go inside people’s mind and by doing so can access their dreams and memories. When the government recruits her to look into the mind a man suspected of being a rebel, she is a little nervous. When she sees a name in his head, it leads her to a boy who claims to have been romantically involved with her. When evidence in his favor begins to pile up, Ella realizes that she has to find out who erased her memories, and why. I loved the world building in this book. Ella lives on a bridge between two islands. The bridge is miles and miles long, big enough that an entire city is built on it. Underneath the city is the lower class part of the city, which is basically a floating city that is made up of individuals boats. In this futuristic world people have androids, who do all sorts of jobs like cleaning, vending, and nursing. The rebel group is made up of the lower class, who are sick of living in decrepit conditions on their floating city while the upper class lives in luxury with androids doing everything for them. When Ella finds out about her memory being erased, she is suddenly thrown in the middle of a war she didn’t even know was happening. I loved all of the medical elements of this book–Ella’s parents’ research, especially her father’s, and the ethical questions that both raise. I also really loved how this tied into the Across the Universe series–it’s actually set in the same world, but still on Earth. 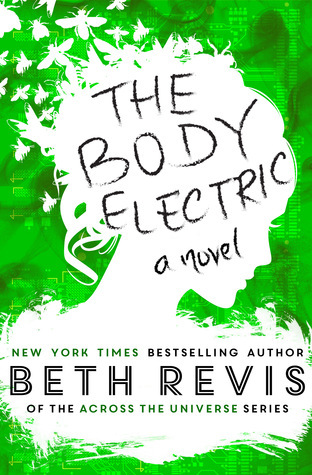 Overall, The Body Electric was an exciting and interesting read. Beth Revis has definitely made me a fan for life and I can’t wait to read what she writes next! The Body Electric was released on October 6, 2014.